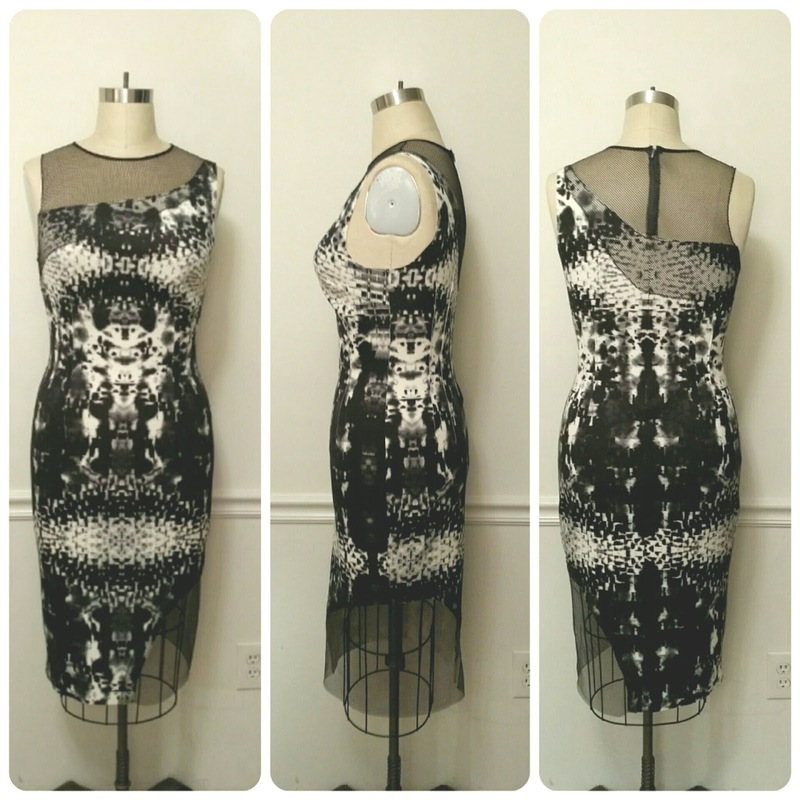 Home Dresses	Neoprene Jersey and Mesh Sheath Dress! I’ve been obsessing over neoprene fabric for a while now. And it seems like the more obsessive I became, the better the fabric is now. Neoprene isn’t as thick and stiff as it was a few years ago. These new and improved lighter weight “neoprene-like” fabrics are a dream to sew with and perfect for structured garments. 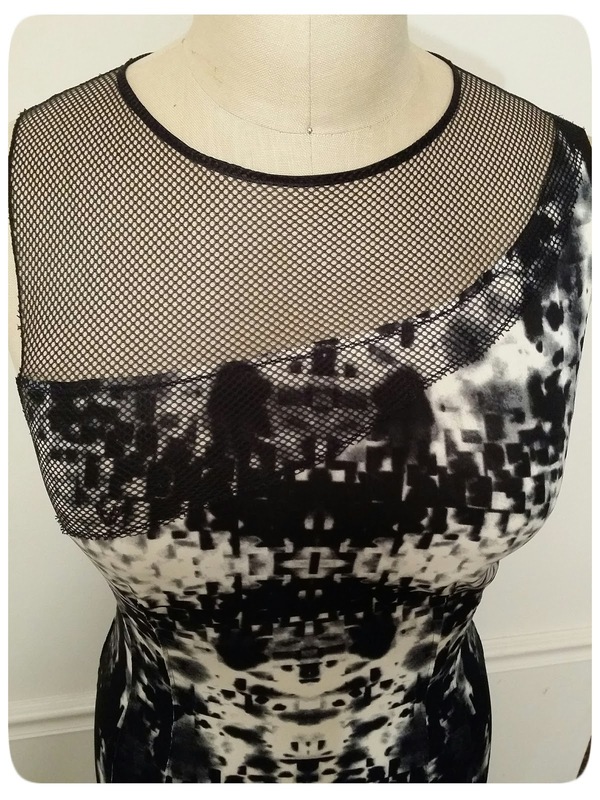 Which is why I picked this black/ivory abstract neoprene jersey. Talk about hard to get! I stalked this fabric for weeks. It sold out and all of a sudden it was back! 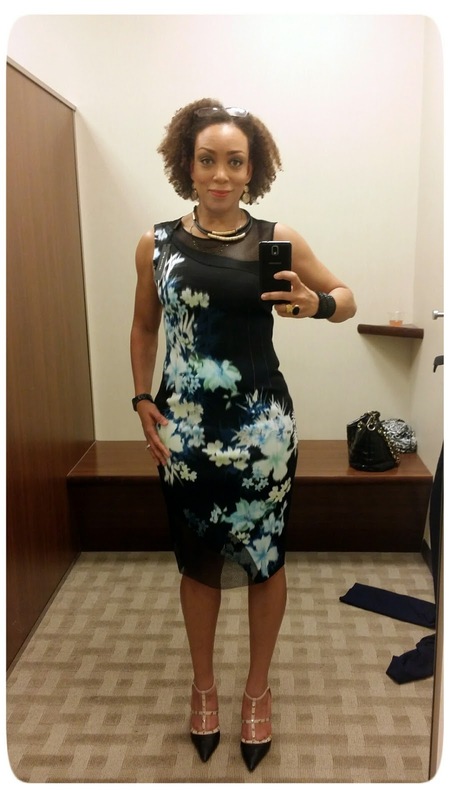 I tried this Elie Tahari dress on in a fitting room and fell completely in love with it. But the $428 price tag made me weep. I examined the dress inside and out and immediately made up my mind that I would be making my own version. And I was pleased as punch when my neoprene jersey arrived because it was exactly the same type of fabric as my inspiration dress! For my pattern, I chose McCall’s 7085. This pattern was perfect, down to every single dart! I used view A, which is just two pieces — the front and back. I cut the size 12. Since my garment is not hemmed, I only had to add 2 inches to the length. All of the darts are sewn lapped. And the side seams are also lapped. 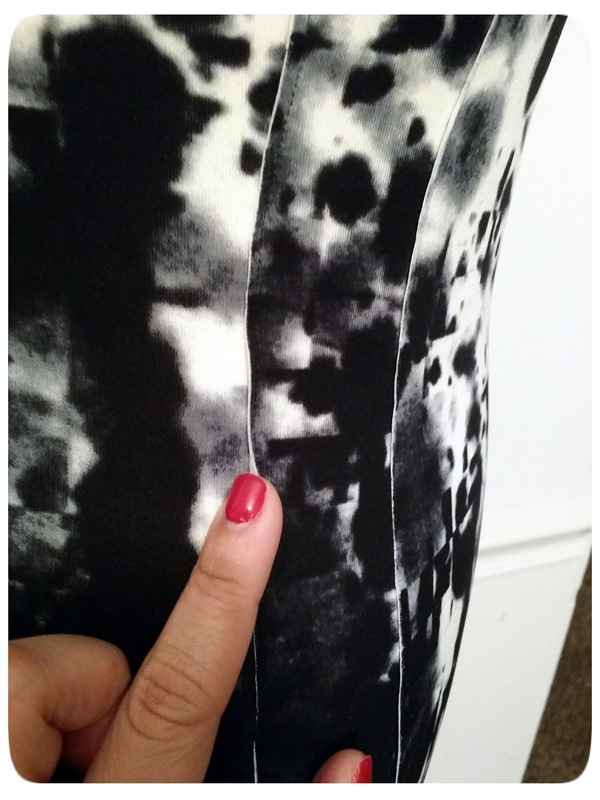 This is a new-to-me detail that I snatched from my inspiration garment. I guess I very rarely make anything that uses fabric that doesn’t ravel and doesn’t require additional measures for seam finishing. It looks simple, but it took a lot of meticulous effort to achieve this effortless look. 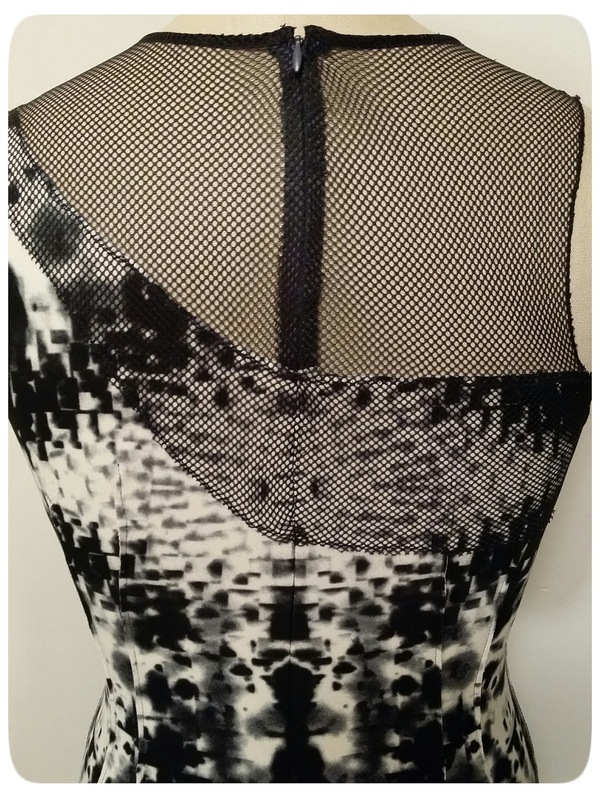 The body of the dress is basically cut as a one-shoulder style, topped with this Italian Black Diamond Nylon Mesh Netting. This was my first time working with mesh and I didn’t know what to expect. 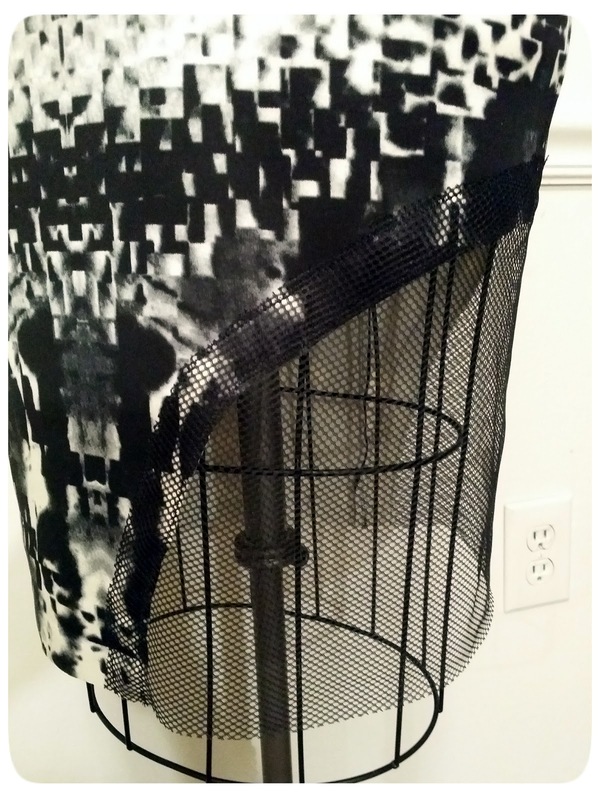 This mesh was not as coarse as the mesh on the inspiration dress, but it still turned out well. I’ve never done any type of applique sewing. Again, a new step for me. But I think it turned out well. I finished the neckline with a satin 1/4″ double fold seam binding. And just did a rolled hem for the armhole. The first time I tried it, I bound the armhole too. Since the other armhole is the unfinished neoprene jersey, there was a noticeable difference to me. It didn’t feel right. So the rolled hem added an unfinished feel to that side. Mesh is very unforgiving if you make an error. If you try to pick a stitch loose? Good luck with that. I butchered the mesh the first go round and had to remove it and do it over. Not fun removing zig zag stitches from neoprene jersey either. But I must take a moment and pat myself on the back and dust the dirt off my shoulder for matching that print down the back! The mesh is also added to the bottom in an asymmetrical cutout way. And the hemline is left unfinished. This was a fun dress to make. It did take a little longer than I anticipated. But it allowed me to release some pent-up creative energy that I had unfortunately been repressing for a while!